ideology, morality, tactics, success rate, or any other criterion except the way they clothe themselves for public view. They seem devoted to only one goal: Each wants to do the other in. Many commentators see it as a perfect metaphor for the Cold War. The Cold War also had much to do with the creation of the feature. Antonio Prohías, the cartoonist who came up with it, was a prominent editorial cartoonist in Cuba during the 1950s — and a very courageous one, too. In the U.S., we think of cartoonists as courageous if they express unpopular views on military spending or welfare reform, but there, Prohías was literally putting his life on the line every time he drew a cartoon that criticized the government. On May 1, 1960, with arrest imminent, he fled the country. Despite his fame and popularity in Cuba, and all the awards he won there, he was forced to take a menial job in New York. But he continued drawing cartoons on his own time, and made efforts to place them in American publications. A few months after arriving, he walked into the office of EC Publications with a six-panel pantomime about a couple of guys trying to poison each other's coffee, and it became his first U.S. sale. It appeared in Mad magazine #60 (January, 1961). At the time, the Madmen didn't see it as much of a continuing series — a few quick jokes would exhaust the characters' potential, and that would be the end of it. But Prohías kept coming up with hilariously inventive new gags within his seemingly one-note scenario, and Mad kept publishing them. This went on for decades, making it perhaps the longest-running feature in the magazine's history. After a year or so, Prohías expanded it slightly by adding a woman in gray, but her occasional appearances don't alter the basic dynamics of the situation very much (other than the fact that when she's on stage, she always comes out on top). Nor does the fact that several paperback collections, as well as a massive compendium of Prohías's work on the series, have been compiled, alter the fact the entire series is made up exclusively of very simple, one-page vignettes. In 1990, after he'd done more than 500 such vignettes, health considerations forced the cartoonist to retire, and the feature was taken over by Mad staffers. His byline continued to appear with it, the change in status noted by rendering it in Morse Code rather than alphabetic characters. Without his wit driving the series, however, it just wasn't the same. It ended in Mad #332 (December, 1994). Prohías died in 1998. 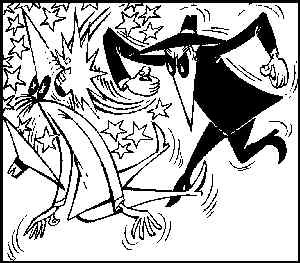 The Cold War is over now, but Spy vs. Spy has lost none of its impact. Reprints are easily available, and they're still seen as a valid, if farcical way of looking at the cut-throat, hero-less world of international espionage. It's been used as a segment in Mad TV. It's been revived, as a newspaper strip from Tribune Media Services. It's started appearing in Mad again, with new episodes by Peter Kuper. And it still brings a laugh to readers of all political stripes.